It's time for another Fusion Challenge - and we've got a St. Patrick's Day inspiration photo and a wonderful sketch. 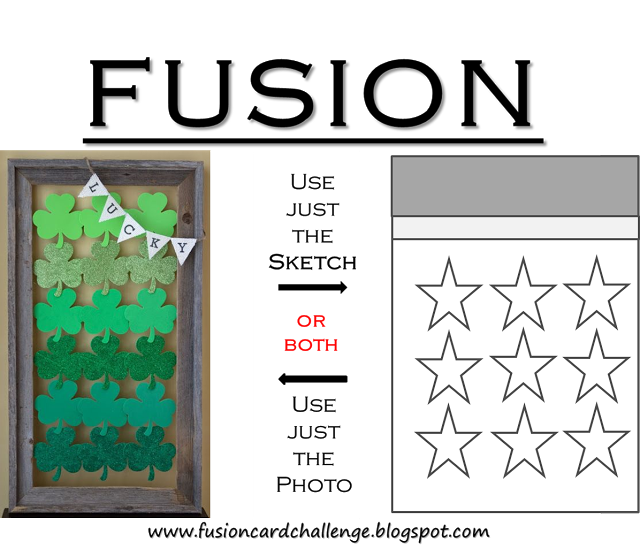 I went with the sketch and star design this time since I don't need any St. Patrick's Day cards this year. 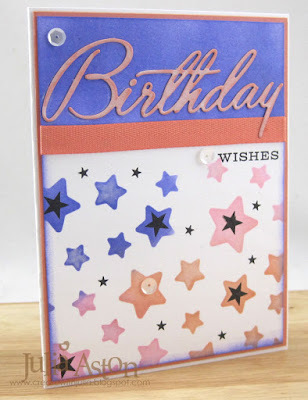 I used a star stencil from MFT with WV Archival inks in Violet, Pink Peony and Tea Rose to get the birthday party feel! Then I masked the star area and sponged the top with the same Violet Ink. I added a piece of twill ribbon to separate the two areas. 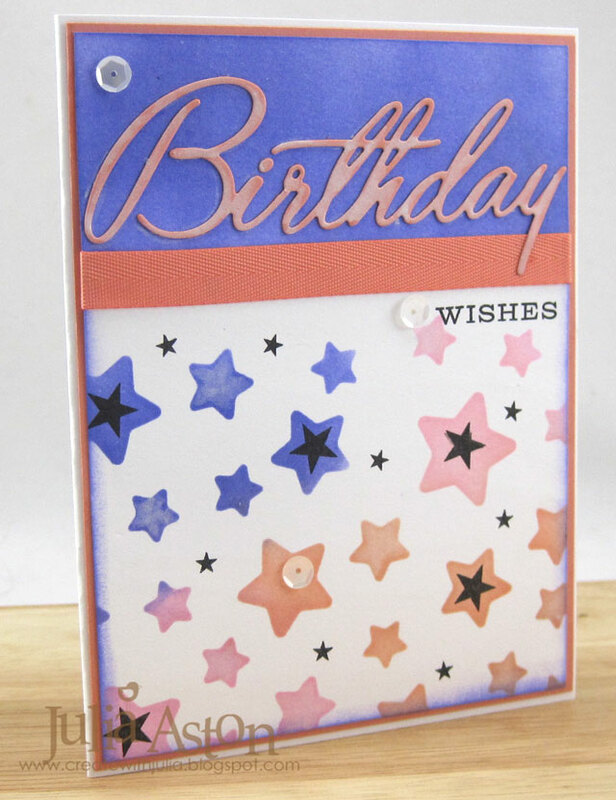 I added a few white sequins and stamped some stars from Star Gazer Additions in black as well as the sentiment from Birthday Cheer. 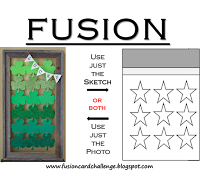 At the last minute I decided to brush over the die cut sentiment and some of the stars with a white glitter Wink of Stella - you can see the shine on it better in this photo. So show us what inspires you with this weeks Fusion Challenge! Link your cards up here. You will find all of the Design Teams cards there too - they are also linked below. and please welcome our first ever guest designer! Accessories: Die - Birthday Cheer - PTI, Melon Berry Twill - PTI, Winter Blend Sequins - Avery Elle, Wink of Stella Glitter White, Scotch Quick Dry Adhesive, ScorTape, Stargaze Stencil - MFT. Julia! I always love seeing what you're up to! 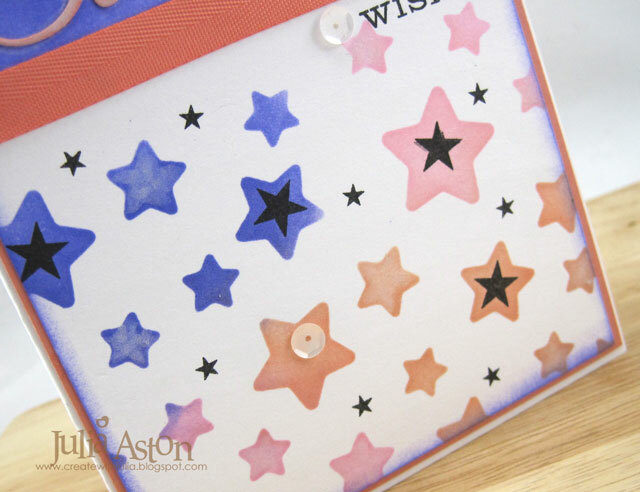 Love the stenciled stars in such pretty colors - you know I love the rainbow of colors! 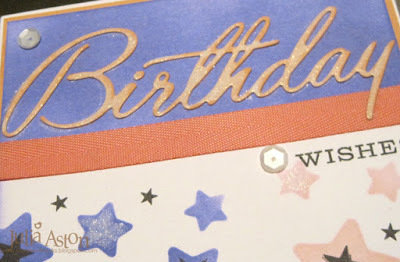 super fun Birthday cards...I need to make more birthday cards! Love the explosion of stars and FAB colors Julia!!!!! Gorgeous card, Julia! Your stenciling looks fabulous!